Murphy J. "Mike" Foster, Jr.
Kathleen Babineaux Blanco (born December 15, 1942) is a retired Democratic politician from her native Louisiana, who holds four first designations for women. Not only was she the state's first woman governor, with service from 2004 to 2008, but the first woman lieutenant governor, the first woman public service commissioner and the first woman PSC chairman, and the first woman from Lafayette elected to the Louisiana House of Representatives. She never lost an election. 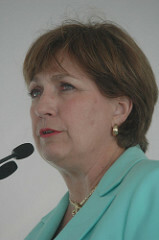 Her one term as governor is remembered largely for criticism that she and her fellow Democrat, Mayor Ray Nagin of New Orleans received about the relief efforts following Hurricane Katrina in August 2005. In the 2003, general election, she defeated Republican U.S. Representative Bobby Jindal. In 2007, Blanco declined to seek reelection, and Jindal easily won the governorship over the Democrat Foster Campbell, a member of the same regulatory agency, the Louisiana Public Service Commission, on which Blanco served from 1989 to 1996. As lieutenant governor, Blanco did not preside over the state Senate, as is the practice in many other states but instead directed activities of the state's tourism office. A native of New Iberia, Blanco has lived for years in Lafayette with her husband, Raymond, a former footvball coach and educator. After attending the defunct Mount Carmel Academy, a Roman Catholic girls' school in Iberia Parish, she graduated with a degree in business education from the University of Louisiana at Lafayette and taught briefly at Breaux Bridge High School. Blanco has six children. On December 10, 2017, Blanco confirmed that she is gravely ill from ocular melanoma, a rare form of cancer, first treated in 2011, but which has metastasized to her liver. "I am in a fight for my own life, one that will be difficult to win," she said in a statement to Louisiana newspapers. In April 2019, Blanco entered hospice care. ↑ Greg Hilburn (December 10, 2017). Former Gov. Blanco gravely ill, fighting for life. The Alexandria (Louisiana) Town Talk. ↑ Greg Hilburn (April 17, 2019). Gov. Kathleen Blanco enters hospice care. The Shreveport Times. Retrieved on April 18, 2019. This page was last modified on 18 April 2019, at 06:25.